For their latest 12”, London based Tomahawk welcome the enigmatic Intimacy for an ethereal blend of house and techno. 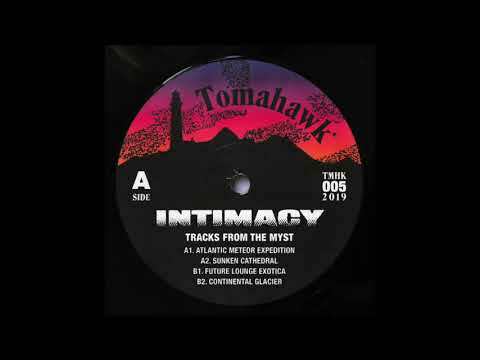 Hailing from the unassuming East Memphis, Intimacy’s productions pursue a unique intersection of sonic landscapes, creating atmospheres that are decisively futuristic and nostalgic at the same time. Merging the propulsive energy of arcade video games with explorative cosmic transmissions, Intimacy is an artist who has mastered the perfect balance of momentum for the body and intricacy for the mind. The Tracks From The Myst EP is the four-track embodiment of Intimacy’s aesthetic, hypnotizing listeners with the beauty and strangeness of the 90s. Our premiere the A1, “Atlantic Meteor Expedition,” opens the EP with cinematic sensibilities: hypnotic chimes, pensive pads, abstract chords, and emotive synth leads wander in wild directions. A steady 123bpm kick and delicate hats give the narrative a sense of continuity, building and sustaining a dancefloor-ready energy. It’s an escapist odyssey that packs a punch. The rest of the EP is equally as powerfully immersive. Each track evokes a unique combination of disorientation and déjà vu, with a pervasive sense of dreaminess flavoring the whole release. We’ll let you discover the rest yourself on the 22nd of February when the release drops on the Tomahawk Bandcamp. Preorder it here!